Possibly the most influential painting in the Hermitage collection, Wassily Kandinsky's 1913 Composition VI was completed shortly before the outbreak of World War I. It would be a decade before the artist completed his next in the series, Composition VII. His 1913 canvas ignited a pictorial revolution based on the idea of exceeding the figurative appearance of form by allowing access to the spiritual world beyond the frame. Composition VI almost seems to predict the major global disaster that was soon to wreak havoc. In the work, the destruction of the material world by the flood of shapes and colour sees forms and appearances disintegrate before the viewer's eyes. The main focus of the composition is the evanescent pink and white core which spews forth large diagonals in the all colours of the rainbow, which, aligned with the strings of a musical instrument, symbolizes a sense of the triumph of harmony over chaos. For Kandinsky, the visual representation of shape and color was not sufficient to develop a formal visual style, instead opting to develop a scale of colour symbolism that would run throughout his oeuvre. Each color and each shape has a specific meaning, a meaning he closely associated with modernist music, and as a result in his paintings arise an actual musical harmony. Following his seminal 1911 essay Concerning the Spiritual in Art which formulated a united front of art production, art history and art education. 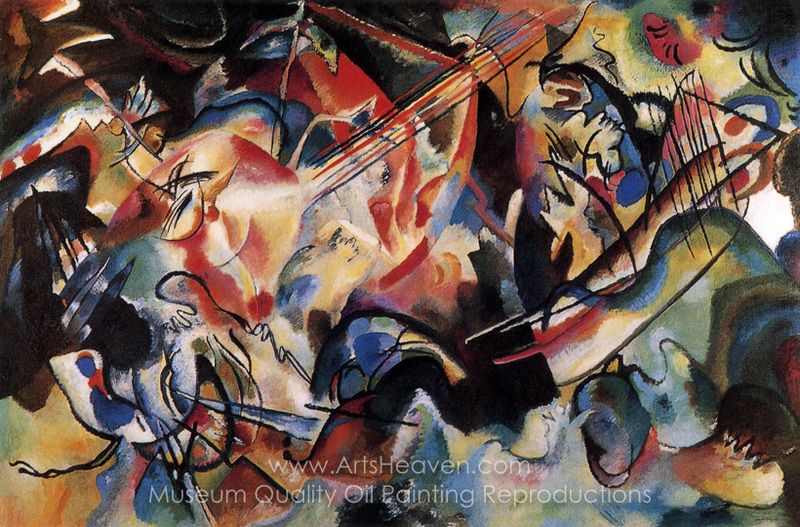 Kandinsky's goal was to streamline the teaching of art as a discipline comparable to that of science. In the course of his career, Kandinsky kept trying to give his ideas an institutional glaze. Composition VI can be read as a reaction to this urge to both education and revolutionize the very nature of art. It is an abstract work rich in color variations and contrasts: from the opaque color tint to an ambiguous sense of precision. Although some colors are dark, the composition remains bright and soft, the black lines only serve to accentuate the impression of movement and set some boundaries in opposition to the masses of blurred colors that blend into each other. In the early twentieth century,a number of artist movements looked for the real subject of their works in the act of painting itself, thus opening the door to abstract painting. Kandinsky's concrete topics distorted color to find its resonances, and his series of Improvisations and Compositions can be seen as piece-by-piece manifestoes of an artistic revolvution. 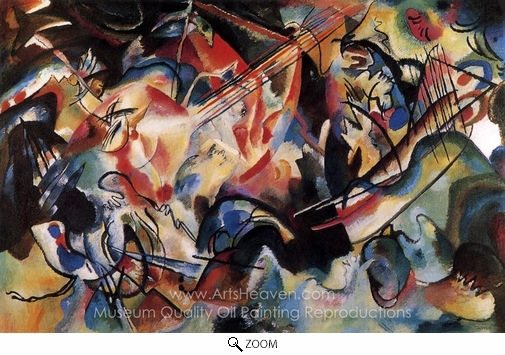 Decorate your home or office with our beautiful museum quality art reproduction of Wassily Kandinsky Composition VI painting. Why settle for a print, poster, giclee or canvas transfer when you can grace your walls with a genuine oil on canvas painting reproductions for sale at up to 75% below gallery prices. You are commissioning an authentic hand-painted oil painting on quality artists canvas. Painted by professional artists brushstroke-by-brushstroke with attention to all details. Order your Masterpiece today and get Free Shipping to your door direct from our studio.